Tonight, I'm bringing you another two-recipes-for-the-price-of-one blog. 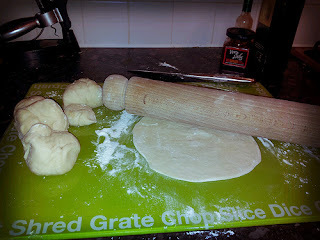 I was actually tempted to save one of the recipes for a blog on another day and have a little night off. But cheaters never prosper and I figured I'd get caught out. In all honesty, I'm only competing against myself with this challenge but I'd be cheating all my lovely readers (*waves at @TamaraLSpencer and @BridestockBride) so here is the truth. Having thought about several things I might want to try for tea today - Tuscan White Bean soup, baked leeks, something with cheese and potatoes, Gordon's Chorizo and white bean soup - I ended up discounting all of them either through a lack of ingredients (the leeks, and cheesy potatoey things) or because I was all souped out (it was so cold at Super-Spy HQ today that I consumed an entire winters-worth of soup in one day). 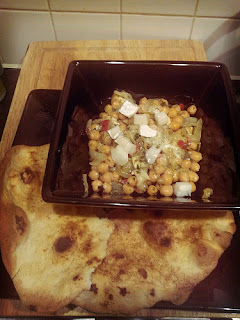 Anyhow, leafing through Gordon's Greatest for some storecupboard recipe or another, I happened across his recipe for chickpeas with feta and flatbread. Ticked off all the ingredients, save for the red onion. Found a bit of white onion in the 'half-used-veggies-to-use-later' bag and Bob was my uncle. Until I realised that the wraps I'd planned so use instead of flatbread were discarded on Saturday due to yet another Ocado short sell-by date issue. Dan Lepard's Short and Sweet to the rescue! Okay, I'm obsessed. Even more obsessed than I was with Thomasina Miers' Easy Mexican Food (or whatever it's called) when I first got that. Fourth recipe in four days from Mr Lepard. And yet again, absolutely spot-on (which is more than I can say for Gordon and his chickpeas). I love bread. Seriously. I would rather poke my eyeballs out than go on a carb-free diet. If I was told I could never ever eat carbs ever again I'd probably be more upset than when I left my teddy on the Isle of Wight ferry (I was six at the time). The tortillas are so simple to make that I will never buy shop-bought again. As there's only two of us, I so often buy a packet of eight and end up throwing six away (I do sometimes remember to freeze them and should be better at being inventive, but sometimes, I just cannae be bothered). It uses no special ingredients - just plain flour, baking powder, salt, milk, water and vegetable or corn oil. Just over an hour for the dough to relax, five-ten minutes of rolling (do as Dan says and roll them out first - rolling and cooking at the same time only leads to expletives being uttered and burnt fingers). Mine weren't perfectly round because I disregarded the roll-first advice but oh my gosh. Warm, homemade flour tortillas. Fab-u-lous darling (said in a Craig Revel-Horward kind of voice). I made a tiny one just so I could taste-test it. Mistake. I then ate two more after taking the picture. Mmmmm. This is why I'm fat. In fact, using the third one in Gordon's recipe spoiled it a bit because they're not so nice when they're baked and crunchy as when they're warm and soft. And this from someone who will always pick a crusty roll or toast over a soft white loaf or a flour bap. Again, I recommend you buy the book. I won't be posting the recipe as it would be unfair of me to do so. Sadly, Amazon have now increased the price to £12.50 but it's still worth every penny. In fact, I would have paid full price for it if I'd been able to road-test some of the recipes first. You can watch Gordy do the chickpea thing here. It looks very pretty, but the taste really wasn't for me. Not sure what's up with me tonight as I love all the component parts of this recipe but I didn't enjoy the end result. Maybe I just wasn't in the mood - it's really a light summer dish. Not something for a cold winter's night. 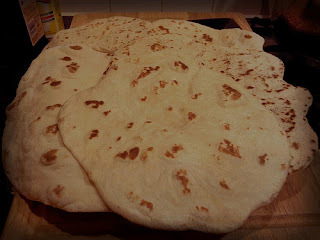 And especially not a cold winter's night when you've just stuffed yourself full of tasty warm flour tortillas. Oops!